Short Description Beagle Browser promises to stop the display of unwanted advertisements. Symptoms Generates advertisements, may slow down the PC. Causes random redirects which take up the whole screen.Creates multiple hotlink shortcuts on the user desktop. Distribution Method Via freeware packages (bundling), or freeware websites. Beagle Browser is a web browser developed by Lollipop Network S. L. It is based on Google Chrome and is classified as an ad-supported PUP by security investigators. Originally It claims to eliminate all advertised content from the websites that are visited by it. However, it does not do that at all. The suspicious browser has been observed to run an unusually high amount of processes that may slow the PC down, obtain user information via cookies and modify particular PC settings. Also, it has been reported to leave several processes in the Windows Task Manager after closing it and remain active in the form of an application running on the Windows Tray. Beagle Browser – How Did I Install It? There are several methods that Beagle Browser may have employed to situate itself on your PC. One of them is by tricking users via a redirect to manually download and install it on the computer. The other and more probable way of installation on a PC is by ‘bundling’. This means that Beagle Browser may have come as a free ‘extra’ along with any other program you may have installed soon. Most users tend to skip some installation steps in their rush to install a program, and this is how programs like Beagle Browser may slip into the PC. Beagle Browser – What Does It Do? Immediately after installation, Beagle Browser put several icons on the desktop that were leading to the most widely used websites. These icons were hotlinks that were opened via the browser itself. The first few times it was started, Beagle Browser did not display any ads, but it did not block any site ads as promised. However after being started for the third time, a very annoying interruptive new web page popped up, advertising an online gambling website with free registration. On the web page description, it said ‘Powered by Beagle Browser.’ So, bottom line, not only it did not block any advertisements but it also caused random redirects to websites that may or may not be scamming the user to enter his personal information that the third party site may collect and use for malicious purposes. 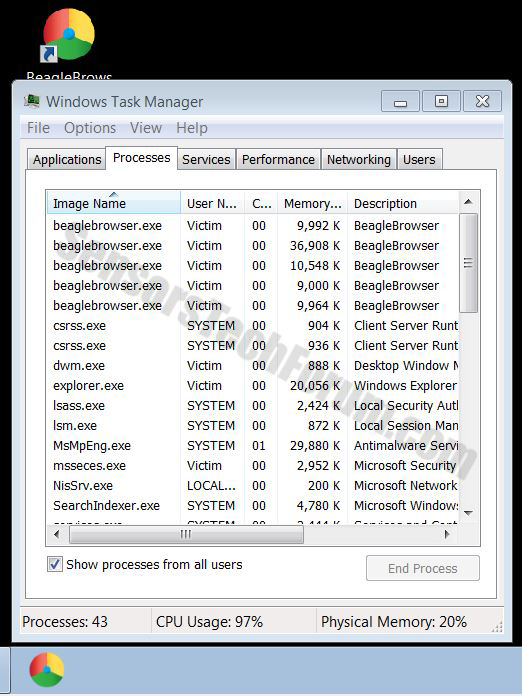 Another suspicious detail that was noticed when the browser was installed on the computer was the fact that it ran twice as many processes in Windows Task Manager. When the browser was closed, there were still some processes running in Windows Task Manager. When those .exe processes were further investigated, it was discovered that the browser ran a familiar extension whilst closed, same as another suspicious browser – Tortuga. This extension was going by the name of ‘Omnibox’ which was not present in the Chrome://extensions list. Omnibox may collect keystrokes to improve search relevance for the user. According to some researchers, it may be common for this extension to be running in the background while the web browser itself is being closed. It is a very useful extension. However, it is a bad sign that it is being used by a browser that displays sudden redirects and ads that lead to suspicious third-parties. When the test machine was scanned for malware, all associated files with this browser were identified as program files of a Potentially Unwanted Program or a PUP. Be very careful what you enter and which websites you visit on the web. IT professionals recommend to stay up to date with the latest suspicious apps and install a reputable anti-malware scanning program that will actively protect your PC. In case you have decided that you have no use of beagle browser, bear in mind that you should uninstall it manually first. To do this, please follow the step-by-step tutorial below. Since Beagle Browser may leave some objects on the computer in various locations, the best solution that avoids the complete reinstall of your OS or the time costly process of manually looking for them is a particular anti-malware tool that eradicate such PUPs automatically. Follow the instructions above and you will successfully uninstall Beagle Browser. 2. 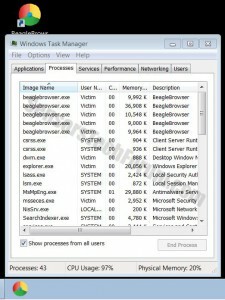 Remove Beagle Browser automatically with Spy Hunter Malware - Removal Tool. 2. 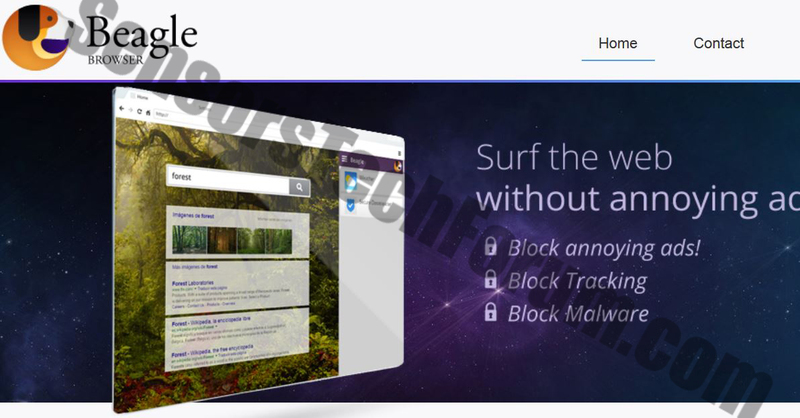 Remove Beagle Browser automatically with Spy Hunter Malware – Removal Tool. Threats such as Beagle Browser may be persistent. They tend to re-appear if not fully deleted. A malware removal tool like Combo Cleaner will help you to remove malicious programs, saving you the time and the struggle of tracking down numerous malicious files. Threats such as Beagle Browser may be persistent on your system. They tend to re-appear if not fully deleted. A malware removal tool like SpyHunter will help you to remove malicious programs, saving you the time and the struggle of tracking down numerous malicious files. Note! Your computer system may be affected by Beagle Browser and other threats. SpyHunter is a powerful malware removal tool designed to help users with in-depth system security analysis, detection and removal of threats such as Beagle Browser. 1. Install SpyHunter to scan for Beagle Browser and remove them. 2. 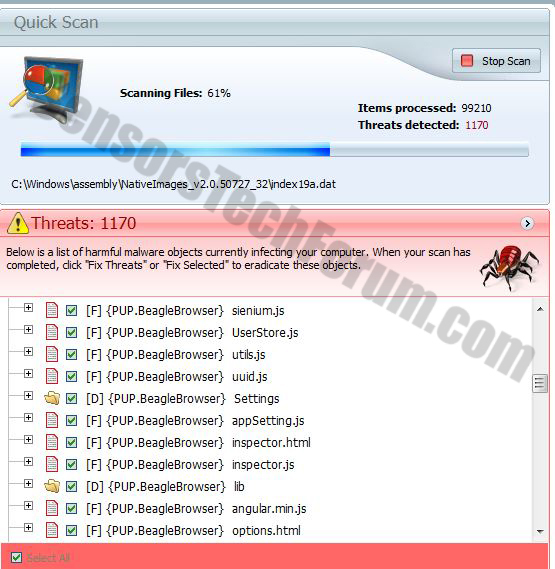 Scan with SpyHunter, Detect and Remove Beagle Browser. Ransomware infections and Beagle Browser aim to encrypt your files using an encryption algorithm which may be very difficult to decrypt. This is why we have suggested several alternative methods that may help you go around direct decryption and try to restore your files. Bear in mind that these methods may not be 100% effective but may also help you a little or a lot in different situations. Note! Your computer system may be affected by Beagle Browser or other threats. Remove Beagle Browser by cleaning your Browser and Registry. Fix registry entries created by Beagle Browser on your PC. Combo Cleaner is a powerful malware removal tool designed to help users with in-depth system security analysis, detection and removal of threats such as Beagle Browser. Step 5: In the Applications menu, look for any suspicious app or an app with a name, similar or identical to Beagle Browser. If you find it, right-click on the app and select “Move to Trash”. Step 6: Select Accounts, after which click on the Login Items preference. Your Mac will then show you a list of items that start automatically when you log in. Look for any suspicious apps identical or similar to Beagle Browser. Check the app you want to stop from running automatically and then select on the Minus (“–“) icon to hide it. Remove Beagle Browser – related extensions from your Mac’s browsers. A pop-up window will appear asking for confirmation to uninstall the extension. Select ‘Uninstall’ again, and the Beagle Browser will be removed. When you are facing problems on your Mac as a result of unwanted scripts and programs such as Beagle Browser, the recommended way of eliminating the threat is by using an anti-malware program. Combo Cleaner offers advanced security features along with other modules that will improve your Mac’s security and protect it in the future. Hey !, I found this information for you: "Beagle Browser Removal and Description". Here is the website link: https://sensorstechforum.com/beagle-browser-removal-and-description/. Thank you.